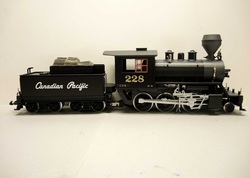 Due to our large and changing in-store inventory we can not list all G-scale products online. Please call or email to order any product or come visit us in Nanton WAREHOUSE. We deliver by parcel post in Canada and USA, and ship by Greyhound bus where appropriate. We can ship to other countries on request. We charge the exact cost, and therefore shipping cost is available after the item has been weighed at the post office. The cost of shipment will vary, dependent on the size of parcel, weight of parcel and destination (receiver). An approximate shipping cost can be given upon request.